a rundown of the kids’ performances at the Stage Time and Juice XXVIII: Winter BREAK! 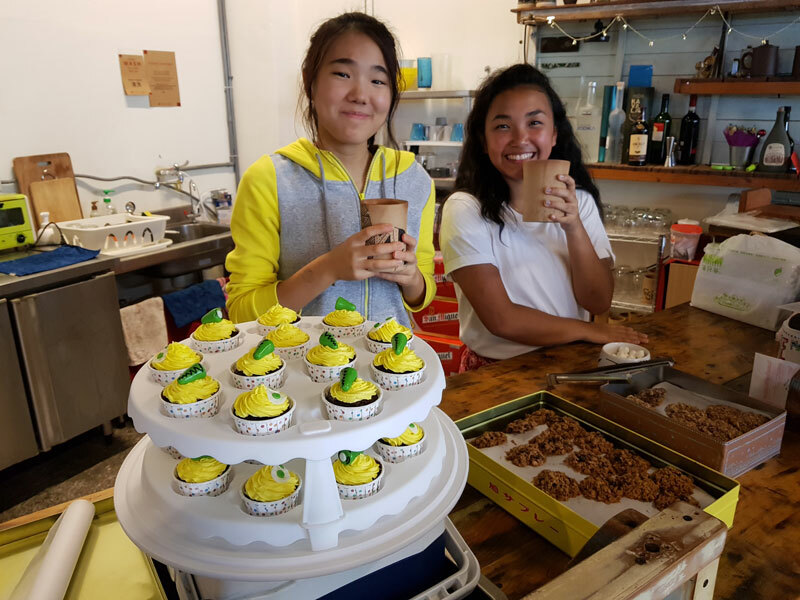 by Carol Yao, our “Juice” Coordinator. 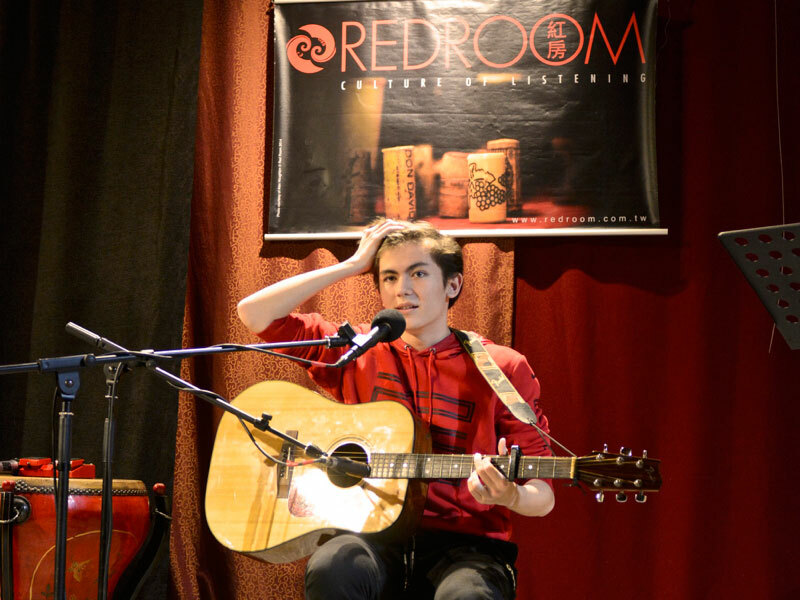 There were solo acts and small groups demonstrating skills learned at Red Room workshops. There were activities designed to get the entire roomful of children and parents up on their feet – dancing! A few photos here to take you there. 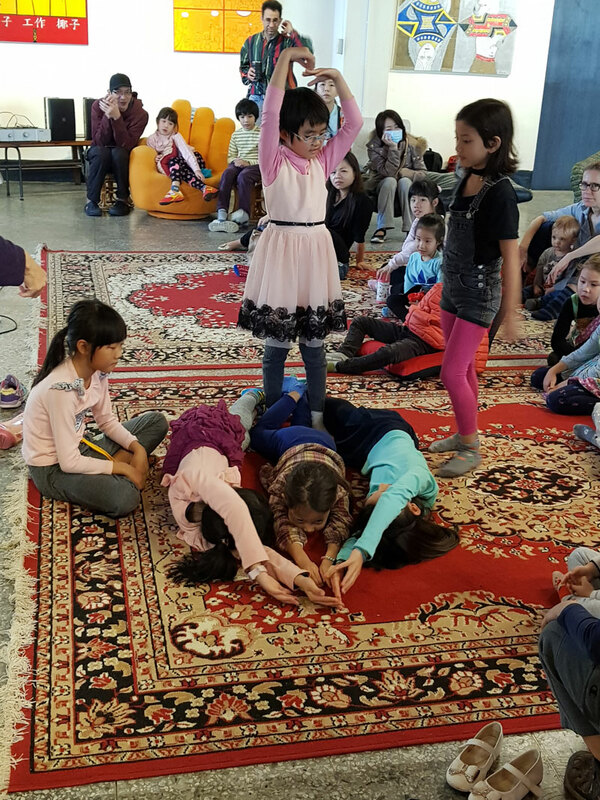 a brief summary of the fun that was Winter Camp I, where five intrepid children allowed themselves to have lots of arts-related fun with six grown-ups at the Red Room. Composed by Ruth Giordano. to highlight the Stage Time and Wine XCV, a rhyming poem with alternating lines in Chinese and English (!) composed by Jessie (our newest intern, remember?). She titled it: Within the walls of the Red Room a revolution rumbles…and illustrated it with photos of some of the sharers. a closer look at one of the acts presented at the Stage Time and Juice XXVIII – a reading of the Dr. Suess classic Green Eggs and Ham by six elementary school girls. They met weekly with Ruth Giordano to practice reading clearly and to coordinate with one another as some of the choice words were physicalized by youngest girls. The girls were photographed in their green hats at their curtain call. a lead-in to the International Women’s Day in March. Letting Go: Can We Free ourselves from gender stereotypes? 開闊眼界,別刻板印象 by Jessie. She includes an evocative drawing to illustrate her article. 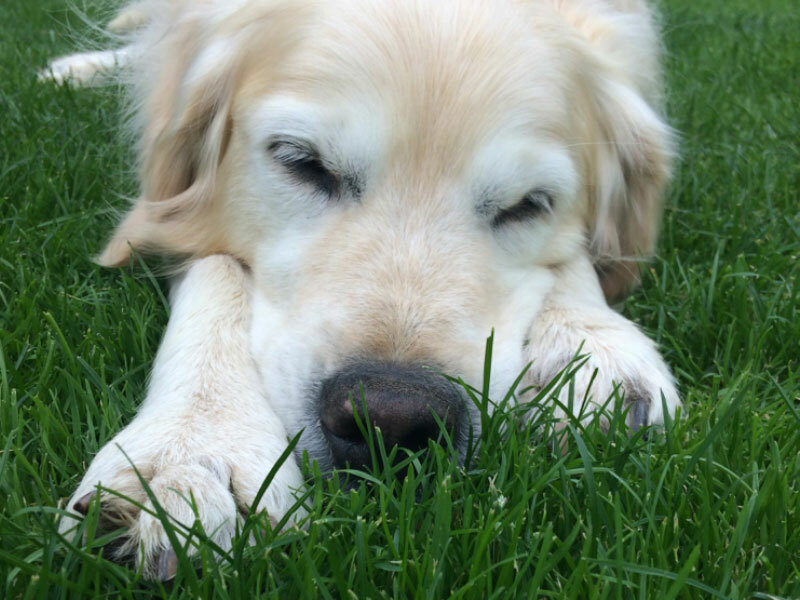 My family dog (Otto pictured above) liked to spend the majority of his days dozing. Sometimes he even used to twitch in his sleep, presumably dreaming of chasing rabbits. For this reason I like to think of the Year of the Dog as the year for dreaming. year-old reality couldn’t be more different. Although I am far from being the mature grown up I imagined, in 12 years I have managed to achieve many of my childhood dreams; I have learnt mandarin, studied in Beijing, hiked on the Great Wall, read the original poem of Hua Mulan in Classical Chinese, and started an exciting new life in Taipei. I still make childish mistakes and I am far from having ‘life sussed’; however, I am proud to have lived the dreams of 12-year- old me. The next Year of the Dog will be 2030. We have 12 more years for us all to achieve our next doggy dreams. Stage Time and Juice XXVIII:Winter BREAK! Stage Time and Juice XXVIII:Winter BREAK! kicked off 2018 with a high energy combination of open mic, drama, storytelling, and break dancing. Juicers were happy to share a full lineup of musical performances with the community. Max opened with “The Bacon Pancake Song”, charmingly accompanied by his mom on the ukulele, and then others took turns on the keyboard, and jazz drums, introducing their favorites, including songs by Ed Sheeran and “The Little Mermaid.” Avelyn debuted a new cello piece she has been meticulously practicing, accompanied by her mother on the keyboard. Our junior improv students gave a brisk and amusing demo of the skills that they have been learning under the tutelage of Sharon Landon. Ruth Landowne Giordano’s troupe read out the classic Dr. Seuss story “Green Eggs and Ham,” with 4 children reading, and 2 siblings enacting the key words while their mom energetically held up the flashcards. Ruth stitched together some felt green eggs and ham for the show! Lilly Sedaghat held a break dance workshop at the end, assisted by two drop-in dancers, Joanne and Mr. Ho, who immediately accepted the invitation to become a part of the action, proving Lilly’s assertion that break dancing not only is great fun, good exercise, and an international language, but also a quick way to make like minded friends. Kudos go to Jonah, son of MC Jennifer Joy, who had a lively time of it managing the stage and sound booth, assisted by first time Stage Time and Juice attendee, Bryan. Bryan came onto the scene without knowing what would happen. His comments later to his mom were: 1) he had no idea running the event would be so busy–this event was particularly so, due to the dynamic nature of the content; 2) he was surprised that learning English in school and having to use it were two different things, and; 3) he would love to come back to help out anytime! Spirits were high, the performances were enthusiastic, and the children ended up spinning on the floor! If you would like a sample of the magic, please visit our Facebook page for some videos and photos that barely describe the love and camaraderie we shared together on this amazing afternoon. Owen and his guitar opened the night. Alex’ story of a snake in his pants gave us all a fright! Ninon’s ideas explored our attachment to beliefs. Christian ranted about his master degree grief. Callie shared with us her biggest best mistake. Manav and his little red box made the walls of the Red Room quake. Chet revealed the memories enclosed within an ornamental synagogue. JJ shared his father’s legacy in a soul-stirring monologue. Joanna’s voice concluded the evening with passion and power. And so the 94th Stage Time and Wine has reached its hour. Join us every third Saturday of every month, for your 5 minutes in the spotlight. At Stage Time and Juice, the performances are not adjudicated. The parents are not required to pitch their progenies’ productions. The organizers like it when people sign up in advance so we have a clue as to how many cookies to make – but, so far, no one who wants to perform has been turned away. That said, for the past year or so, there’s been a quiet movement to organize and rehearse small groups of small people who want to perform for their families and friends in the informal setting that is Stage Time and Juice. Parents sign up their kids. A small fee is taken. The children meet a few times before the designated Juice date. They learn each other’s names and a few theatre games, they practice breath control and enunciation and they read (or re-tell) stories with Ms. Ruth. Ms. Ruth is Ruth Landowne Giordano. 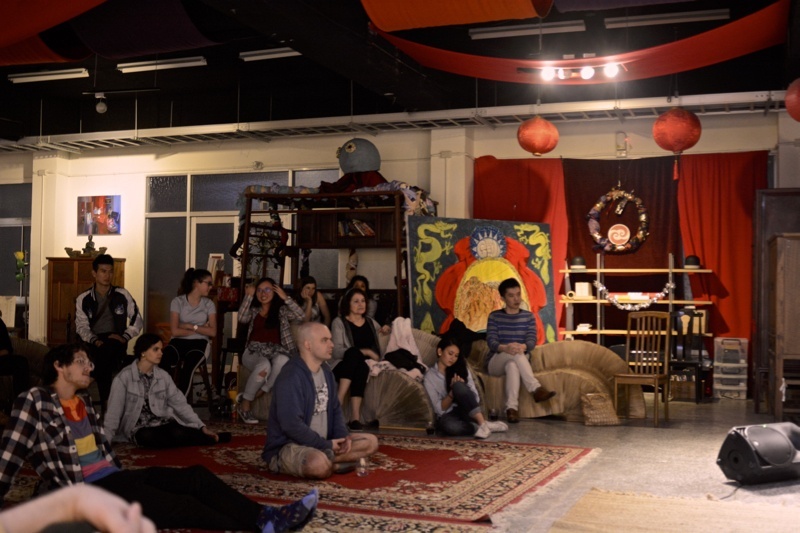 After many years practicing theatre arts in the US, she came to Taiwan to support her husband in his career as an educator. Here she found Red Room and started Red Room Radio Redux to share the fun of reading stories out loud. The January Stage Time and Juice 2018 was well-attended and our Juice Players (temporary name) prepared and read Dr. Seuss’s Green Eggs and Ham. The original dialogue takes place between two characters: “Sam” and “The Other Guy” (He is never named). In the spirit of Suess-ian fun, each performer wore a green stocking cap and a silly time was had by all! Carol Yao is a whiz-kid. When she decides to do something, you can bet that it will get done. for over four years. What is Stage Time and Juice…? 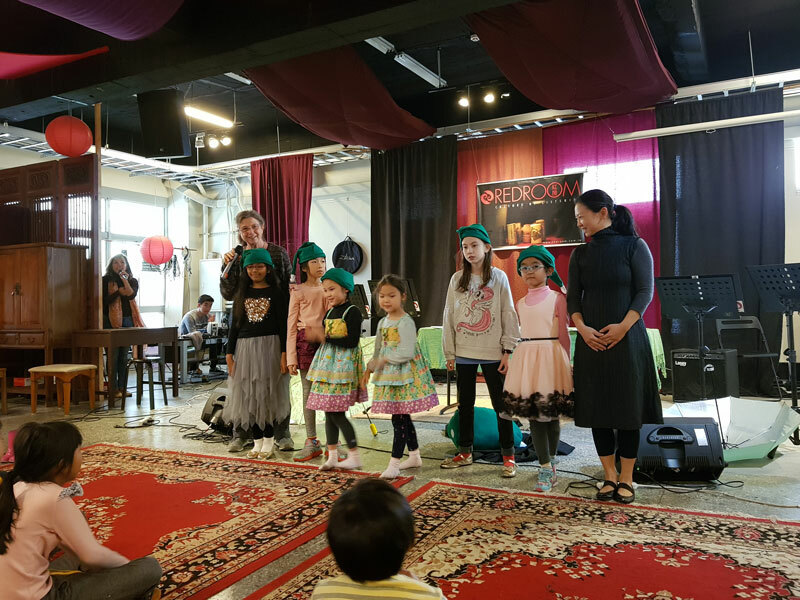 An adapted version of Stage Time and Wine, ST&J is an exciting monthly event collaborating with Taipei City Playgroup focused on encouraging children of all ages to discover and express themselves creatively in a performance/audience venue. 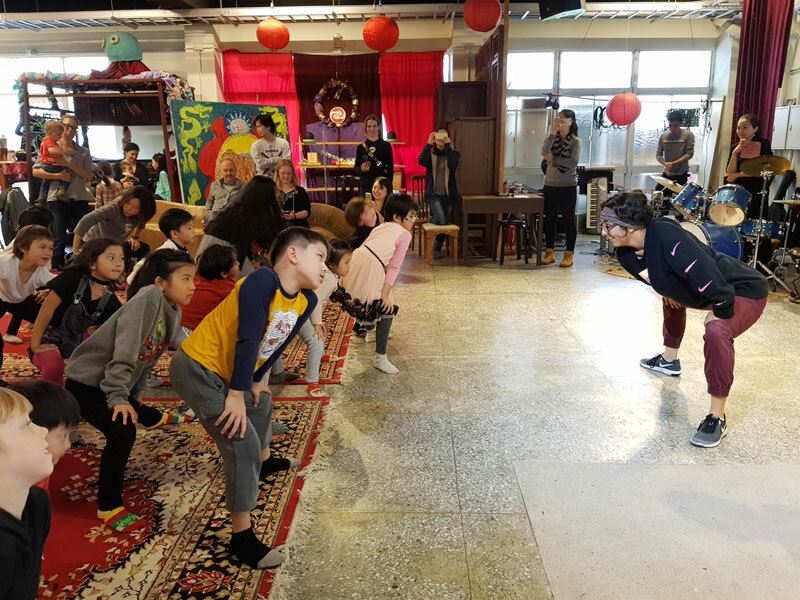 Less than a month before the public-school winter holiday, Carol decided to organize a winter camp for elementary school children to take place for the first few days. She may’ve started relatively late but she hit the ground running and got results. She sat with Ruth Giordano and Sharon Landon, two performance arts workshop leaders and wrote up a draft of an idea: Three days, 10 AM – 4 PM. Lunch included. She gathered three additional artist/teachers to lead a variety of arts-related workshops: Hip-Hop Dance, Up-cycle Crafting, Tie Dye with Natural Materials, Improvisation and Story Theatre. Our minimum number for attendees was six and, at the nth hour, we had five confirmed plus one uncertain. We went with five. Rose Huang oversaw the day: greeting the kids, saying hi and bye to the parents and taking care of details in between. The age range was 6 – 8 so there was no separation anxiety. Rose, herself, led the Up-cycling Workshop where she helped the kids personalize and assemble battery powered nightlights. She also led a tie-dying workshop, using turmeric for a brilliant yellow and, later, for a yummy egg salad. Hip-hop dance classes were led by our intern Eann Yueh-an Chang. The kids absorbed generous helpings of Cool. Artist Eva Lo led an hour of collective storytelling. After the story was created, each child drew illustrations for parts of the story. Then they told it all back. After lunch, Rose Huang led the small group in a brief guided meditation. She adds, “I believe it was successful. In the afternoon, the group met with two workshop leaders whose focus falls under the heading of Dramatic Arts. Ruth Giordano lead the children in Story Telling and Showing. The children told commonly known stories using words and then developed skits using their bodies and voices. They learned the meaning of the words Gesture, Body Language and Mime. – Nurtures developing personality and enhances memory. – Improves imagination and storytelling abilities. – Focuses attention and builds confidence. – Allows for new friendships to develop in a safe and welcoming environment. – Provides a supportive and positive outlet for creative energy. At the end of the third and final day of Winter Camp, parents were invited to see the results of the three-day experience. The up-cycled nightlights and the turmeric tie-dye were on display and the kids demonstrated their improv sills and presented their rehearsed story-skits. After the First Annual Winter Break Camp at Stage Time and Juice, it was agreed that an extraordinary experience was enjoyed by everyone! Letting go: Can we free ourselves from gender stereotypes? From the perspective of education, wages, women in the workforce and positions held by women in politics, Taiwan has made extraordinary leaps towards gender equality over the past few decades. Taiwan certainly looks great on paper; in 2016 the Directorate General of Budget, Accounting and Statistics (DGBAS) ranked Taiwan 38th in the world for gender equality. However, beneath the surface of statistics, ingrained mindsets about gender roles and stereotypes are still lurking. When I typed the words ‘women in Taiwan’ into Google, instead of finding pages celebrating Taiwanese female artists, entrepreneurs, scientists and politicians, the first suggestions were dating websites for ‘exploring Asian women in Taipei’. Websites which objectify women and turn them into a product. These ideas seem to run deeper than a simple internet search. Gender stereotypes and patriarchal tendencies can still be observed in Taiwanese society; for example, during Cai Yingwen’s political campaign she was criticised for still being single and some medias focused more on her appearance than her policy ideas. From talking to Taiwanese friends I found it interesting to observe how different sexes perceive each other; for instance, some male friends described successful women as aggressive or money-obsessed (拜金主義者). Whilst my close female friend feels pressured by her parents-in-law to give up her dancing career and have a baby this year, a decision directly concerning her own body. Perceptions of ‘what it means to be a woman’ still run deep in the veins of Taiwanese society. 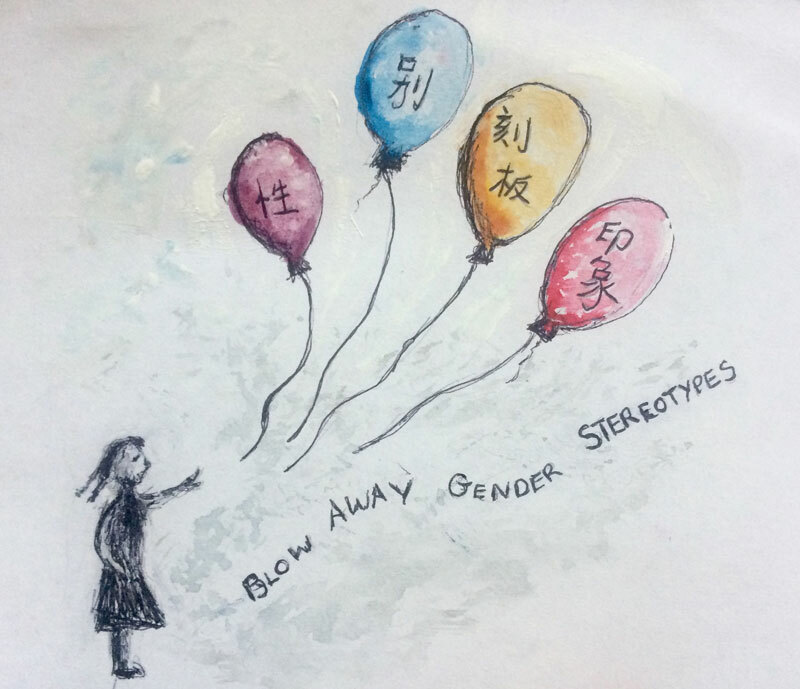 Can we ever deflate discrimination and blow away all gender stereotypes? 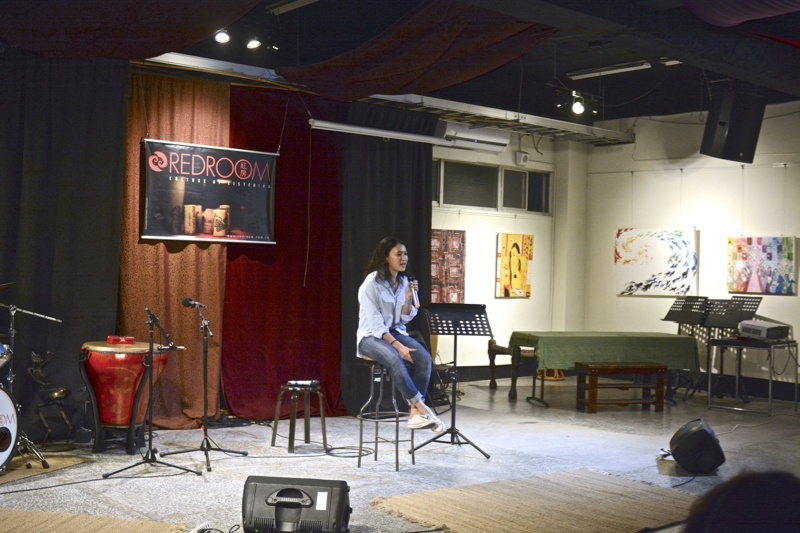 Let’s gather together at the Red Room to celebrate all women. Let’s celebrate female artists, musicians, entrepreneurs, athletes, writers and teachers. Let’s support women’s organisations, charities and NGOs. Let’s unite to celebrate international women’s day and acknowledge all women in Taipei from all different communities. Let’s not define ourselves by gender but by our achievements and the beauty we can create around us.